The GreenFinder team spent an autumn break at Bluestone holiday village set in the beautiful Pembrokeshire coast national park last week and we were struck not only by the natural beauty of the area but the sustainable ethos running throughout the whole resort. On arrival you unload your luggage at your lodge and then take your car to a long stay car park where it has to remain until you leave. This means for the rest of your holiday the 500 acre resort is virtually car free (there are exceptions for disabled guests) and you are encouraged to get around Bluestone by either walking, cycling, electric buggy or by jumping on their minibus shuttle. Living on a main road and being used to heavy traffic and noise on our doorstep it was lovely to be in such a quiet environment for a change. As keen cyclists we loved the fact the roads around the village were car, noise and pollution free….pure bliss. 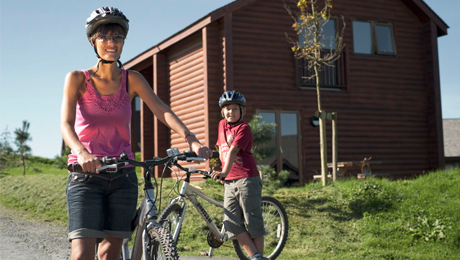 Add the fact that cycle stands are provided at all of the lodges and around the site facilities and we don’t think you’d find a more cycle friendly place to holiday. 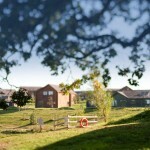 Their transport policy is not the only aspect of Bluestone which is environmentally friendly. All south facing lodges have solar panels and their sports centre and blue lagoon waterpark are heated by an on-site biomass energy centre which uses locally grown miscanthus grass. Recycling bins are provided in the accommodation and around Bluestone and the majority of the food served at the on-site restaurants and pub is sourced from within a twenty five miles radius. All lodges are built from sustainable and local wood and have been designed to blend in perfectly with the surrounding woodland. Green credentials aside we had a fabulously relaxing time at Bluestone. The food was delicious, the lodge perfect and the surroundings tranquil and leafy. The facilities were top notch and the staff helpful and pleasant. We enjoyed woodland cycle rides, a fantastic boat trip to Ramsey Island, where we saw baby seals and a host of birdlife, and spent a lovely day out visiting the stunning Newgale beach and the quaint little city of St. Davids. Having never visited Pembrokeshire before it’s certainly somewhere we’d like to revisit so we can explore some more. Top quality accommodation, lovely food, friendly staff and great facilities all in a beautiful, peaceful setting….what more can you ask for in an eco-escape? For more information about Blustone visit their website and for last minute autumn deals click here.